Serious Sam Double D XXL was delisted from Xbox Live Arcade by October of 2015. It was included in the The Serious Sam Collection which is also delisted in digital form. The game was delisted as Mastertronic Group went into Administration in November of 2015. A PlayStation 3 version of the game was in development but was never released. Continue reading for the whole story. 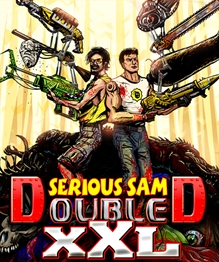 “Serious Note: Serious Sam Double D XXL is a NEW and ORIGINAL Serious Sam title! Yippee!! One gun sometimes not enough? Two still too wimpy? Try firing all your guns at once with the GUN STACKER system! Two-Player Local Cooperative Play – Huff will be the second playable character! He’s that crazy guy from the Gunstacker video! 21 Campaign levels with 3 Sam-insane vehicle levels! Gunstacker Upgrades – Shotguns that fire a horde of bees, Prism Lasers, the return of Serious Sam’s trademark Cannon and much more! Over 30 new guns to fire! New Enemies in glorious 2D! Fight fire-belching TORCHER KITTIES, exploding-banana shooting CHIMPUTEES, evil pancakes known as VUVUZELATORS! Corpse-Piling Technology! Sometimes the best way out is up–on dead monster CORPSES! Jump Pad technology: Anywhere, ANYTIME throw a jump-pad and get a leg up! SECRETS and ACHIEVEMENTS galore, find new max health upgrades, ammo, armor, extra weapons and even comedy secrets! Unlock 12 CHALLENGE ROOMS such as 4 chainsaw fights, and post your scores on the official LEADERBOARDS! Unlock 6 HEAD-TO-HEAD Arenas and teach your friend who’s boss with a laser rifle stack!